Time once again for #TwinTuesday. 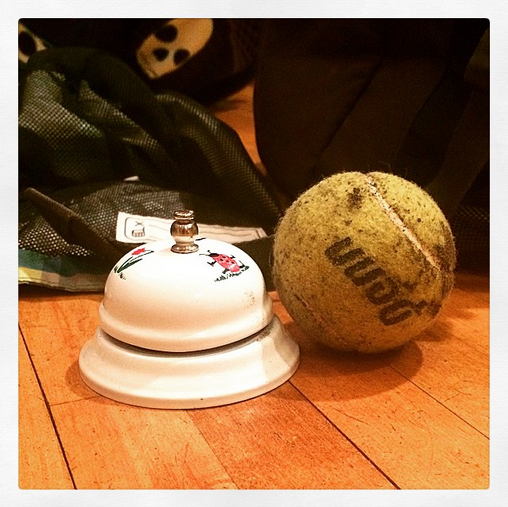 Today we have (on the left) Bell, and (on the right) Ball. I'm pretty proud of my execution here because it required that I remember to bring my school bell home. I do indeed use that bell. It's the signal for the students to be quiet - that I have something vital to share with them. So, here's what I did: I wrote in my planner: "Bring home bell." And then - THEN! - I read my planner, retrieved the bell from the front table, and put it in my backpack. Finally, I checked off "Bring home bell" from my notes list. And that's how it's done, people. That's how it's done. I love that planner. One may need appear in my life after all. I also love this #TwinTuesday. How is it possible you both had a bell? This is an unexpected pairing of greatness.